SAGE is honored to choose a recipient for the Sherry Hamilton Memorial GT Educator Award. 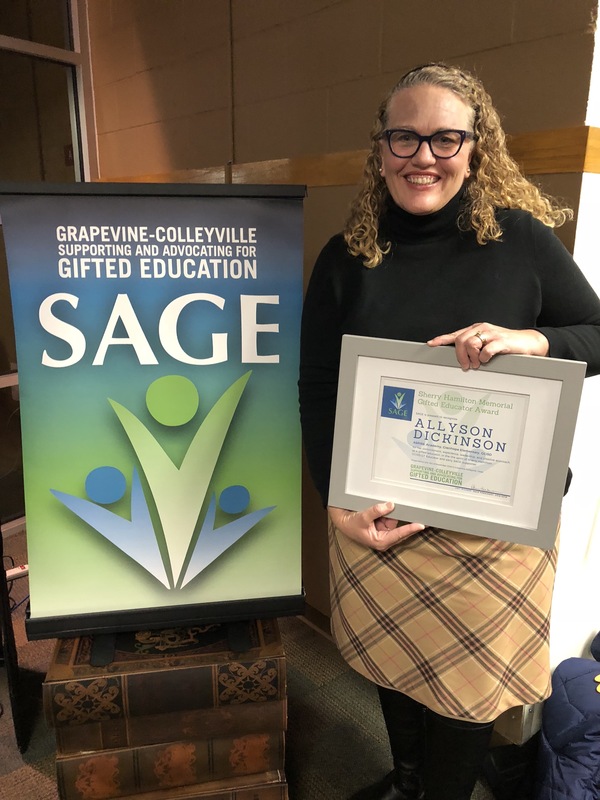 The recipient will show commitment, experience, leadership, and creative approach as a gifted educator, in the the spirit of Sherry Hamilton, GCISD GT Educator and early SAGE supporter. The inaugural recipient was recognized on November 13, 2018, at the SAGE Gifted Pathways event, along with a monetary award of $500 provided by the Sherry Hamilton Memorial Award Fund. [ UPDATE ] The Legacy Continues: Hamilton family donates $500 toward next year’s award: The day after SAGE announced the recipient of the Sherry Hamilton Memorial GT Educator Award, we received a donation of $500 for the award fund from Mr. Garry Hamilton, husband of the late Sherry Hamilton. We are grateful and humbled by this gift to SAGE — our thanks to Mr. Hamilton for his generosity! The concept of SAGE was born in a classroom at Grapevine Elementary School in the fall of 2010. That GT classroom belonged to Sherry Hamilton. While she did not realize the future impact of the movement, she was supportive of the parents who were interested in creating awareness of gifted students and of their desire to educate teachers and administrators about the unique educational and social/emotional needs of gifted and talented students. Sherry Hamilton passed from this life Thursday, Sept. 7, 2017 after an extended illness. She began teaching in GCISD in 1986. She taught at Cannon and Dove Elementary Schools, then devoted 12 years as the gifted specialist at Grapevine Elementary until she retired in 2012. She had a passion for all children and especially for gifted children. She never hesitated to share her knowledge and love of GT children with anyone who wanted to learn how to help this unique group of children reach their potential. The SAGE president will schedule a judging meeting between November 7 and November 12, and will invite SAGE Lifetime Members to this meeting. Only people physically present at this meeting will be allowed to judge. In the case of a tie, the SAGE President will be the tiebreaker and make the final decision. Individuals who have nominated someone may not serve as a judge. Individuals related to a nominee may not serve as a judge. Send questions to info.gcsage@gmail.com and please include the words “Sherry Hamilton Memorial Grant” in the subject line of your email. Many of the district gifted specialists, active and retired, along with some former administrators who all worked with Sherry, initially donated $400 toward this scholarship fund in memory of Sherry Hamilton for the continuation of future educational opportunities for teachers of gifted students in GCISD for this school year. If you would like to donate, please click the PayPal button below and use PayPal, a credit card or a debit card. You will have to log into PayPal. If you have trouble using this button, please open your PayPal app, log in, and send money to members.gcsage@gmail.com and type Sherry Hamilton in the memo line.